Who can ever resisit biriyanis.. we have so many variations of them with vegetables, mutton, chicken and today I have made with chicken mince for a change. Chicken Keema/Mince .... 200 gms. 1. Heat oil in a pan and add the sliced onion. 2. Saute for 5 minutes and add the tomato, chillies, garlic-ginger pastes and the cleaned chicken mince. 3. Stir-fry until it is brown and cooked, adding the cumin, coriander, turmeric,chilli, garam masala powders and salt. 4. In a bowl beat the curd/yogurt and mix the finely chopped coriander and mint leaves and biriyani masala. 5. To make the rice, heat some oil and tip in the whole cardamoms, cloves, bay leaf and cinnamon stick. 6. When they leave out aroma, add the washed and soaked rice. Saute and add salt and three and half cups of water. (little less than double, because we will add curd while layering) Cook until done. 7. In a small bowl take little cooked rice and add the kesari/orange food colour. 8. In a pyrex serving dish, layer the biriyani. First white rice, the keema, yogurt with greens-biriyani masala and spoon a little coloured rice. Pour hot oil on each layer. Repeat this again until the rice and mince are used up. 9. Cover it with a foil and keep it in a pre-heated oven for dum. about 5-7 minutes. You can even layer it in a different pan and keep for dum on the gas, low flame keeping the pan on a tawa/griddle. Garnish with boiled eggs before serving. It can be served with raita or Mirch ka Salan. Am inviting myself to ur place, super delicious and inviting biryani. Wow.......beautiful presentation & the biryani looks yummy. Thanks for dropping by Anshu. Lovely presentation n yummy biriyani!! DELICIOUS!!!!!!!! !thats one yummy looking biryani. I love rice in any form. This looks and sounds delicious. My mouth is watering. I wished I lived close to you...I'd be feasting like a king! (LOL) As always, excellent instructions & presentation. Thanks for sharing. Ha ha.. nice to hear that my recipes keep reminding you not to forget cooking .You should try it when you come back. I like any flavored rice and biryanis are my favorite. 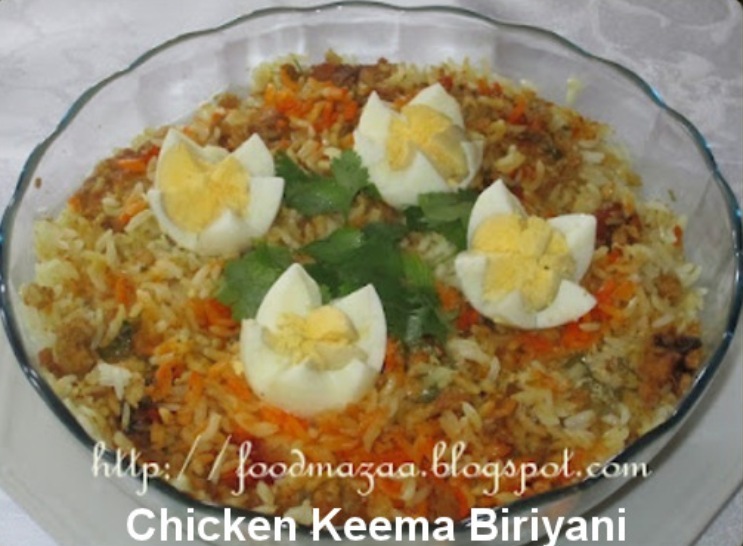 Keema biryani looks great! Thanks for sending it over to Chicken Feast event. Thanks Usha.. Biriyanis are my favourite too.. always make many variations. Nice tasty one !! Thanks for linking to the event !! Appreciate it ! !